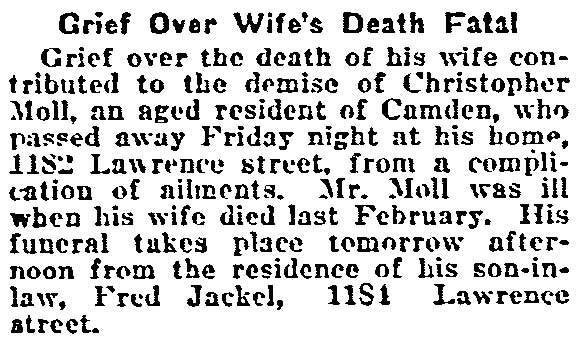 Camden People - Christopher Moll Jr.
CHRISTOPHER MOLL JR. was born on October 23, 1890 in Camden, New Jersey to Christopher and Anna Moll. He was the youngest of nine children. 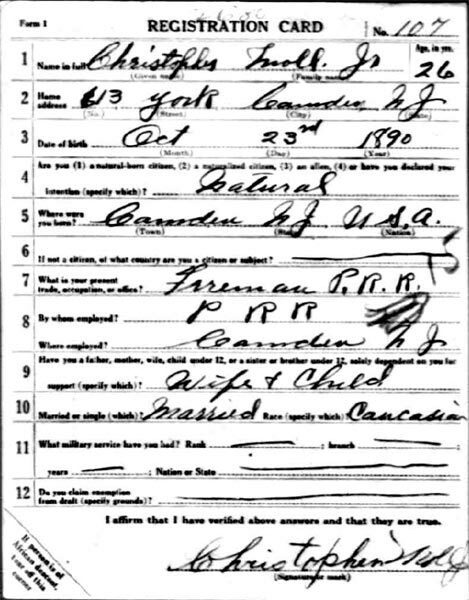 His father supported his family working as a butcher, and had brought his family to Camden from Philadelphia shortly after the 1880 Census enumeration. The family lived at 1166 Maple Street in the lat 1880s and early 1890s. The 1900 Census shows the family at 212 North Twelfth Street, and they still were living there in 1910. 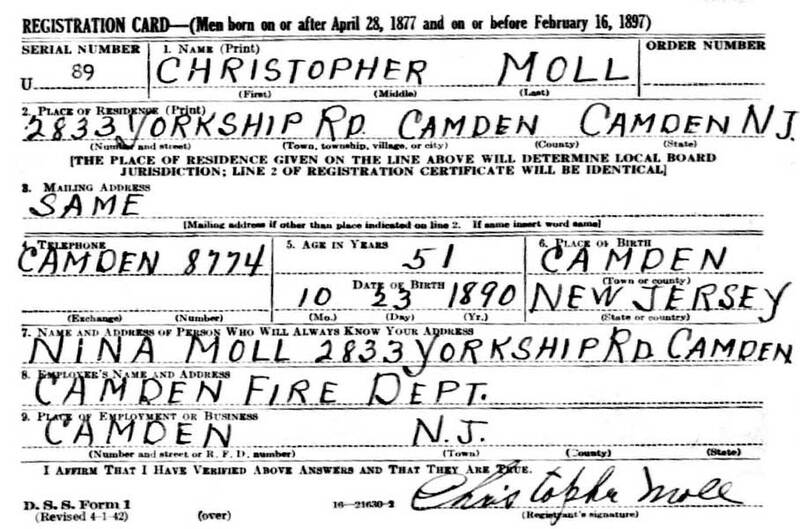 Christopher Moll Jr. was still living at home when the Census was taken in 1910. 610 York Street by the spring of 1918. 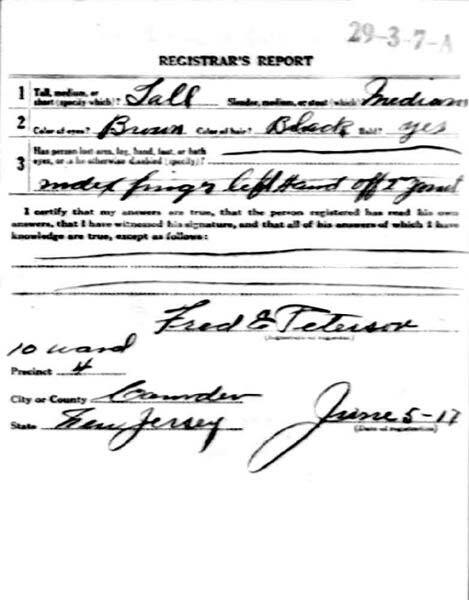 The 1920 Census shows Christopher and Nina Moll living with their two sons, Thomas and S. Stewart Moll, at 46 South 28th Street in East Camden. Christopher Moll was working as a machinist in a factory. By 1924 Christopher Moll and family had moved to 2833 Yorkship Road in the then relatively new Yorkship Village section. He was then working as an auto mechanic. 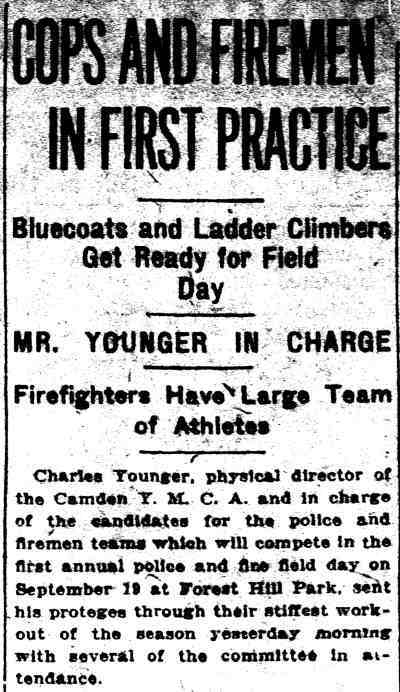 By 1927 he had joined the Camden Fire Department, and was still serving as late as 1947. 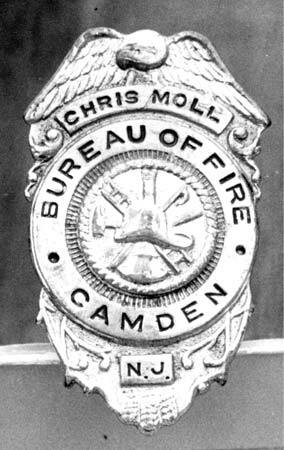 His older brother William Moll joined the Camden Police Department, around the same time, where he served for about 30 years. 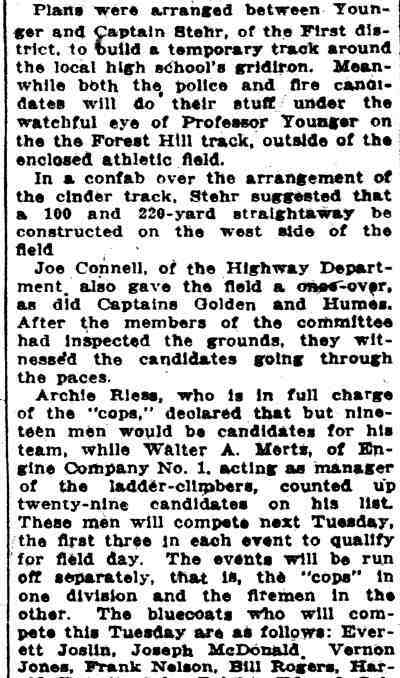 Another older brother, Frank Henry Moll, also served as a police officer in the mid-1920s. Christopher and Nina Moll were still living on Yorkship Road as late as the spring of 1942. 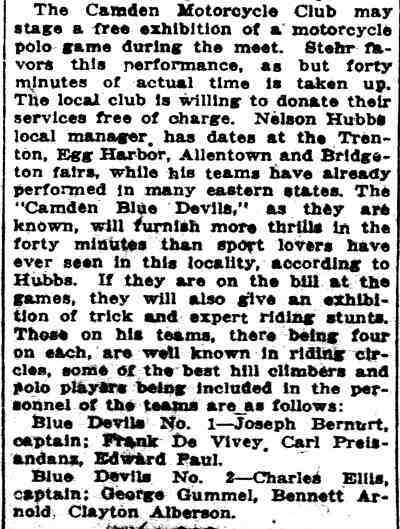 By the time the 1947 Camden City Directory was compiled they had moved to 204 White Horse Pike in West Collingswood. 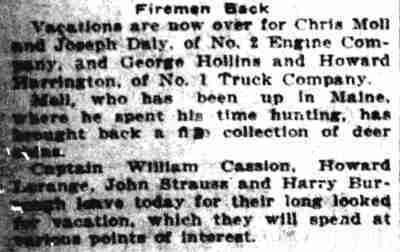 He was then still employed by the Fire Department. He retired on November 1, 1955, having reached the mandatory retirement age. The 1956 New Jersey Bell Telephone Directories lists him at 311 Richey Avenue in West Collingswood. He was still living there when he passed away in September of 1967. 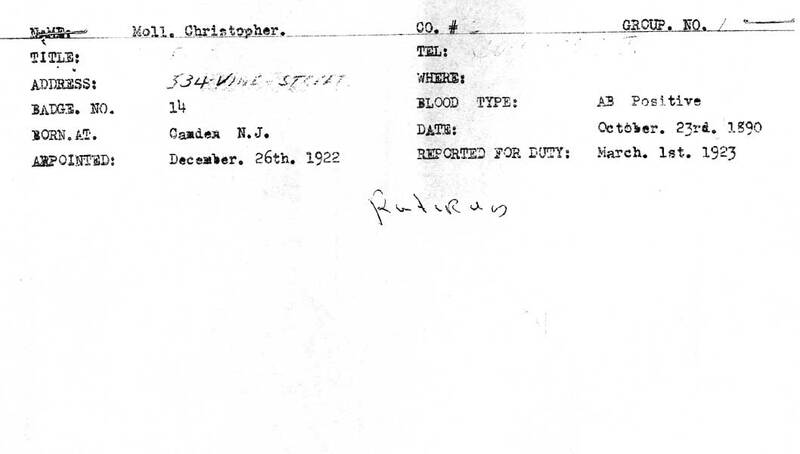 Christopher Moll was survived by his wife Nina, who remained on Richey Avenue through at least the fall of 1970, before moving to Beach Haven, New Jersey. She died in February of 1976. The hour-long effort of a fire department rescue squad Friday night saved a woman who tried to kill herself by gas. summoned the rescue squad headed by Captains Godfrey Patterson and George Boone. 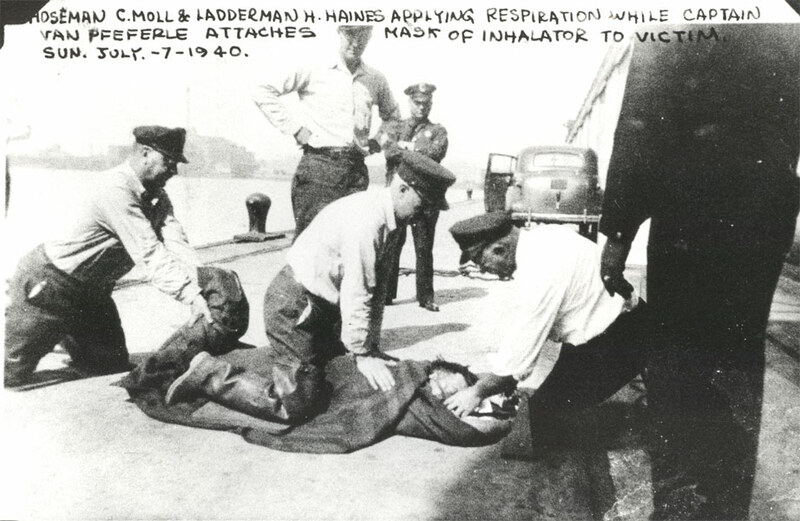 It took the squad an hour to revive Mrs. Marshall by artificial respiration. 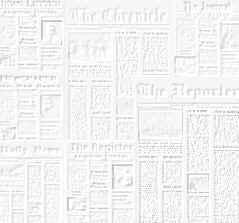 She was taken to Cooper hospital and later to police headquarters, where she was released for a hearing Monday on a charge of attempted suicide. 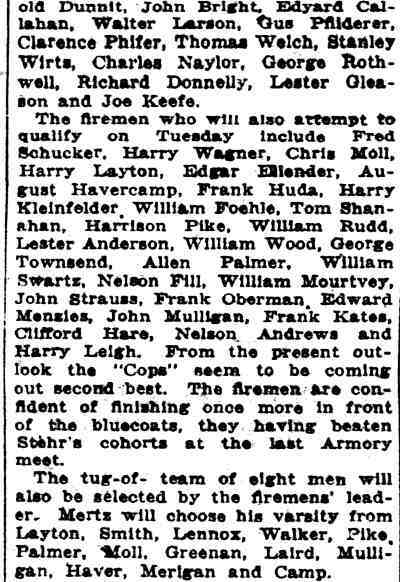 Other members of Rescue Squad 1 are George Baxter, William Watkin, John Mogck, Edward Brendllnger, Arthur Ballinghoff, Christopher Moll, Edwin Decker, Carl Wirtz, Robert Olesiewicz, John Kolessar and Raymond Banford.